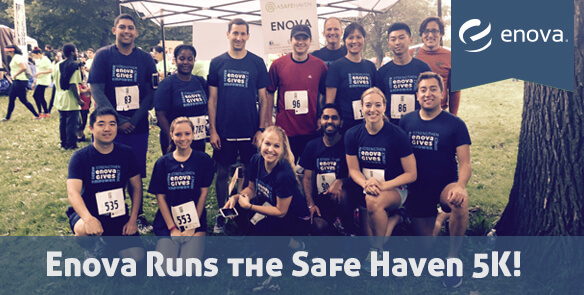 Enova’s A Safe Haven 5K - Enova International, Inc. It was a busy morning in Douglas Park, much more than you would expect for a Sunday morning. 50 Enova Runners and walkers filled the Northeast corner of the park readying themselves for the Safe Haven 5K! The Enova tent was in a prime location right next to the music stage making it easy to find and in the middle of all the activity. After a couple of team pictures, the Enova runners started lining up looking for a prime starting position and doing final preparations before the run. After a few quick words and a brief speech from the Lieutenant Governor the runners were off. Although it was the early morning, there were plenty of spectators cheering on the runners, especially the many individuals to whom Safe Haven had provided aid. After the race ended, the Enova tent once again proved to be in a great position. It provided a place to listen to music and watch the many dancers who were in attendance moving to the beat. As the Enova team finished their post-run stretching and cooling down, they started drifting home to enjoy the rest of their weekend. Enova had a strong performance in the race with four runners in the top 25 overall! I would also like to make a special call out to David Fisher for finishing in the top three of his age group. If you’re interested in seeing the final results of the Safe Haven 5K, check it out here!